For numerous women in Saudi Arabia chafing under the restrictive regulations of one of the most patriarchal and socially repressive countries in the world, being able to drive a car would seem like the ultimate expression freedom. In the face of advancing modernity and the future they have waited rather patiently for the kingdom to have a change of heart and give them that liberty. But when women need the presence or permission of a male relative or guardian to do much of anything, waiting for a chance to do something solo must seem to take forever; but not anymore. The King of Saudi Arabia has issued a decree that many women in his country have been waiting to hear: they can drive. On Tuesday, September 26, King Salman announced a royal decree giving women in Saudi Arabia the freedom to drive vehicles. The statement also talks about how the long period of denying this right has significantly soured the ultraconservative Kingdom’s reputation in the international community, and speaks its hope that granting this liberty will help with their relations to other nations. Over the past months Saudi Arabia has been engaging in a wide range of sweeping reforms tied to Vision 2030, a development program that means to diversify the Middle Eastern country’s products and manufacture in order to wean their economic dependency off of the steadily depleting world fossil fuel supply. Part of the reforms the royal government is promoting is the encouragement of women to begin participating in the workplace with new job opportunities being allowed to them. While this has been perceived as a positive, the initiative has been hobbled by the limited mobility afforded to women, who would need to be chauffeured around by male relatives or hired drivers in order to go to work. The only other vehicular restriction that has been lifted from Saudi women has been allowing them to ride bicycles back in 2013. Passing of the freedom to drive has been mostly accredited to Mohammed bin Salman, former Saudi Minister of Defense and now Crown Prince and heir to his uncle King Salman. The progressive-minded prince is seen as having successfully asserted his authority over traditional Islamic clerics who are among the bitterest opponents of the measure, mostly for cultural considerations but also for flimsy reasons (one cleric claimed scientific proof that women driving cars damaged their ovaries). To prepare for the full implementation next year, the king is calling for a high-level committee to study what changes in public interactions must be made to ease the transition of women drivers on the streets of Saudi Arabia. The Renaissance was a period from the 14th to 17th Centuries that was characterized by advancements in learning, the arts and trade. It origins lie in a cultural movement that began in Italy, and within Italy this movement was said to have been born in the city of Firenze, or Florence. Founded in Roman times, during the Middle Ages it changed hands between barbaric overlords until it was secured by the Christian king Charlemagne in 774 AD. At the turn of the Second Millennium (1000 AD) Florence developed as a commune that engaged in trade and banking, and was the site of the earliest evolution of art. Planning on traveling to Italy can sometimes be made less simple when it comes to deciding where to go. 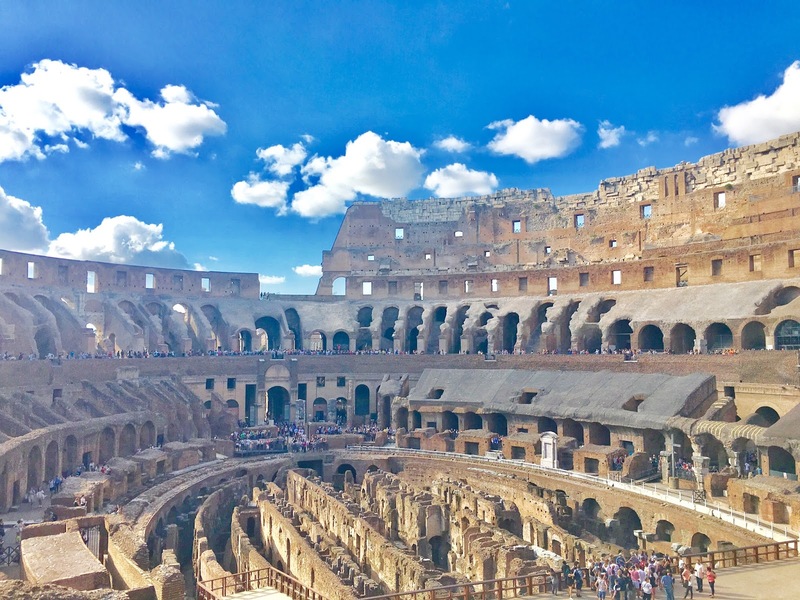 Aside from the storied wonders of its capital and ancient city of Rome, the country has a formidable selection of cities to consider visiting, each having their own grand history, culture showcases, art collections and choice cuisines. It is understandable, considering that before the formation of a united modern state, Italy was once a collection of independent city-states, republics and minor kingdoms, a situation that encouraged the development of unique cultures, and a strong sense of provincialism to this day. This is easily seen in the five autonomous regions of Italy, and most especially at the northeastern region of Veneto, where a nationalist movement actively advocates for either greater autonomy or complete independence from the rest of the nation. All this stems from the strong spirit of its regional capital, easily one of the most beautifully constructed cities in the world. A community built on a collection of small islands, using canals for roads and watercraft for vehicles, this city was once a republican city-state and one of the mercantile powers of the olden days. Today it is one of the primary tourist destinations of Italy: the City of Canals named Venezia or Venice. 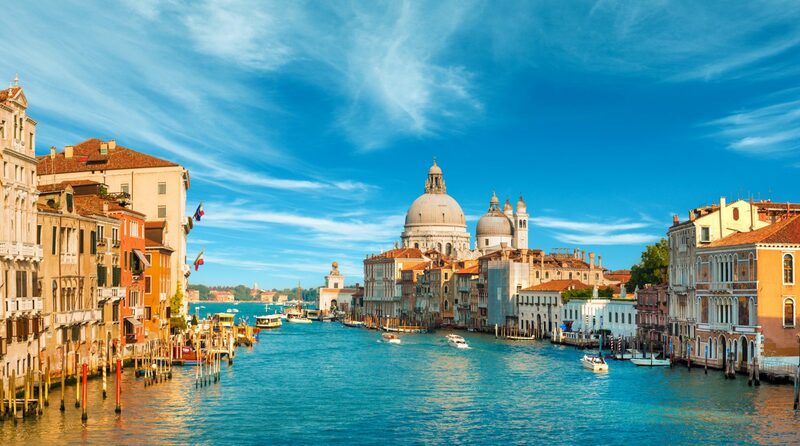 But before it can reach these historical heights and gain the fascination of present-day travelers, the origins of Venice were much humble, occurring in a time of great danger. In the twilight period of the Roman Empire, when its heartland in the Italian peninsula could no longer defend its settlements from invading barbarian hordes, groups of refugees from the surrounding area fled to the marshy islands of the Venetian Lagoon where they built a series of settlements. Over time these island communities were unified into a town and city, with their first leader, called the Doge, being elected in the 8thCentury AD, making Venice a republic in government. Due to its strategic location, Venice began to develop as a merchant port and trading hub between Western Europe and the Eastern Roman (Byzantine) Empire. During the Crusades to the Holy Land the city was an important staging point for the Christian armies, although the Venetians delved in dastardly manipulation of the 13th Century Fourth Crusade by having them sack the Byzantine capital of Constantinople. It was also during this period that the enterprising merchant Marco Polo undertook his journey to Yuan Dynasty China and lived for a time in the court of Kublai Khan. But Venice’s time in the sun came to an end with the rise of both the Ottoman and Holy Roman Empires, and its formerly lucrative eastern trade was damaged by the discovery of the New World. Reduced to simply trying to assert its independence, Venice ended up being conquered by Napoleon, then later annexed by Austria-Hungary and finally “unified” with Italy, though some nationalist sentiments lasting until today may take exception to that. Present-day Venice has ridden high on the foundation of its prominence in European and Mediterranean history. To that end the city has taken steps to carefully preserve the landmarks of the past to such a degree that the center of Venice at first glance seems unchanged from how it was in centuries past. Historians and scholars might say that if Marco Polo accidentally travelled to our time period on his way back to Venice from 13th Century China, he might arguably still recognize it as his hometown. Across a side canal from the palace is the New Prison connected by the Bridge of Sighs, because popular legend has it that condemned prisoners would sigh at their last sight of the outside world as they were led to their cells. Another historical bridge is the amusingly-named “Bridge of Breasts” where prostitutes used to “advertise” themselves to potential customers. Venice is also a significant center of the Catholic faith, being accorded its own archdiocese that is seated at the Basilica of Saint Mark, which is styled in a blend of Italian and Byzantine. It was also called the Church of Gold for having mosaics with ground gold in the designs. Another prominent church is the Basilica of Santa Maria della Salute, built in the 17thcentury as a token of gratitude by the Venetians who survived an outbreak of plague at the time. The arts are also ably represented in Venice, which has one of Italy’s twenty state academies of art. The Academia had its own gallery, which became an independent art museum in 1879 and contains masterpieces of artists who worked in Venice like Titian and Tintoretto. Even Leonardo da Vinci is represented here by his drawing of “The Vitruvian Man” (referred to in “The Da Vinci Code”). This flooding is contributing to the deterioration of the land foundations that the city sits on, and the tendency of tourists to overcrowd whenever they arrive is no help either. Sadly, the worsening conditions have spurred residents of the city to move to the mainland, and only about 20,000 still live on Venice proper itself. Such a state of events makes it feel like there is now a ticking clock hanging over the Queen of Canal Cities, one that reminds people to come and see it with their own eyes while the city still stands over the water. It is a sobering thought, but that should not rob you of your enjoyment should you ever pay a visit to Venice. Hopefully it will heighten your appreciation for the City of Canals and former empire of merchants and traders, and pray that ongoing international efforts may yet preserve it for future generations to see. At roughly the middle portion of the Mediterranean Sea between Europe to the north and Africa to the south, there is a large peninsula jutting out, shaped like a boot and seemingly kicking an island by its “toe.” This stretch of land, nearly surrounded by water save for its connection to the mainland, was the home of a great civilization from ancient times, and conversely is home to one of the relatively younger nations of the modern world. “Republicca Italiana,” the republic of Italy, is a peaceful and prosperous country – third largest European GDP, 8th largest globally – that is steeped in history and tradition: birthplace of the Roman Empire, home to the heart of the Catholic Church, cradle of the Renaissance and port of origin for many famous explorers during the Age of Discovery. 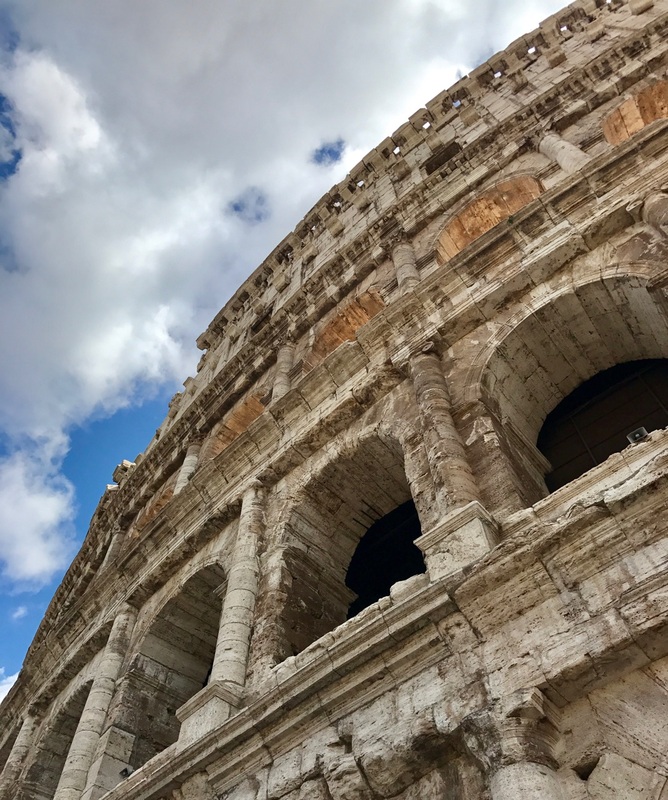 To Italy the world owes the Latin alphabet, the republican form of government, opera music, ballet, pizza, pasta, and many wonderful things than can be listed here. Visiting Italy also feels like visiting multiple countries in one go, which is rather accurate due to the unique characters of its constituent regions, which were very much separate states over a century and a half ago. The present Italian Republic came from the Kingdom of Italy which was born back in 1861. From 27 BC to 480 AD it was the center of the Roman Empire. But in between those two periods, for several hundred years the Italian peninsula was divided into territory held by the Pope or individual city-state republics, or duchies that are much larger but never quite covering the whole of the boot, or “Io Stivale” as its inhabitants today would describe it. Italy as a unified country in modern times is younger than France, Russia, Spain, the United Kingdom and the US, which means Italians have less of a national identity more regional identities. But that also leads to having a rich diversity of culture and tradition that is also a powerful draw for tourism. This diversity also extends to the lay of the land itself. Owing to the length of its landmass, Italy has a varied climate, from subtropical in areas closer to the rest of Europe, to typical Mediterranean in the south. One can go from spectacular mountains and valleys in the North to the South’s warm-summer beaches, which can also be found in the islands of Sicily and Sardinia. The country boasts having the most beautiful lake in the world – Lake Como – and shares the highest point in the European Union with France in Monte Bianco (Mont Blanc). Other peaks of interest are the Matterhorn (shared with Switzerland), the Dolomites and the volcanic Mount Vesuvius, destroyer of the Roman town of Pompeii, the ruins of which are not far from Naples. And so we come to the major cities of Italy, many of which were once independent city-states before the modern unification. It is not surprising therefore that they possess a distinct provincial spirit from one another. Rome, the capital, is of course accounted as the first and foremost among these communities, being the center of the ancient Roman Empire, whose traces are still visible and preserved in the form of the Coliseum, the Pantheon, the Forum, and the many imperial palaces of old. Milan is arguably second in individual importance to Rome economics-wise, due to its being one of the centers of the Italian Renaissance, as proven by Leonardo da Vinci’s “The Last Supper” on a basilica refectory there. 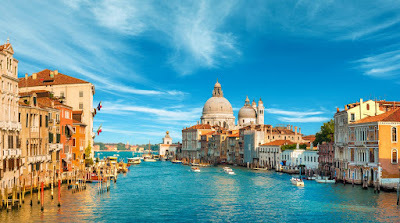 Other cities of note are Venice, the world-famous City of Canals, a UNESCO Heritage Site, and oft-declared as the Most Beautiful City in the World. It is one of the most-frequently visited locations in Italy, with tourists cruising down the canals on traditional gondolas and other watercraft to visit all of its places of interest. 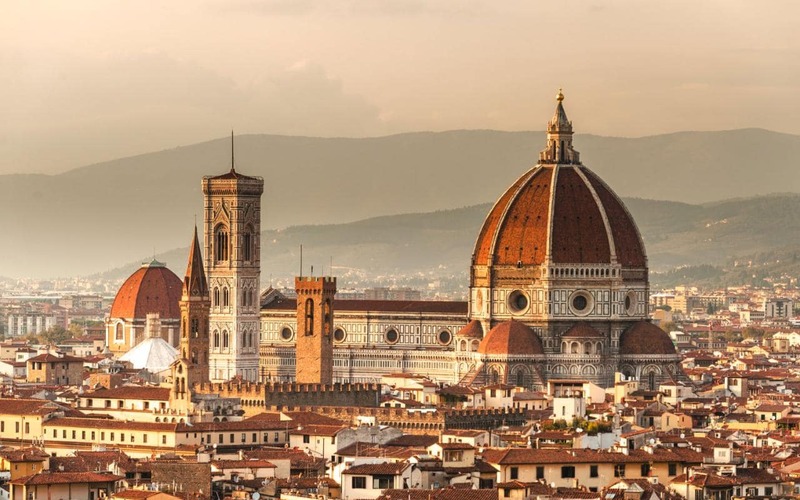 Florence of Tuscany region is one of the major art centers of Italy, thanks to its past rule by the powerful Medici family, who were the ultimate patrons of the arts. Pisa, also of Tuscany, is immortalized worldwide by its Leaning Tower. Genoa is another Italian port city that is historical for being the birthplace of legendary explorer Christopher Columbus. But Italy is more than just its boot-shaped mainland. There are two major islands that are essential parts of the country, Sicily and Sardinia. Both are administrative regions with autonomous status owing to their distinct cultural identity and prevalence of minority languages. As islands in the Mediterranean their climate is rather similar to the islands of Greece to the further east, though with Sardinia’s larger size it has more variety of weather conditions. Both also have near-common prehistoric and ancient historic markers, having been either settled or colonized by the Phoenicians, Carthaginians and Romans, before being passed around by other European powers or becoming independent at alternating periods afterwards. Sicily, separated from the toe of mainland Italy’s boot by the Strait of Messina, is a cultural melting pot with influences from Arabs, Norman Vikings and Greeks. Its most prominent geographical feature is the volcano Mount Etna, which figures in Greek mythology as either the prison of the monster Typhon or the forge of the god Hephaestus. Pop culture has also made it famous worldwide as the home of the Mafia, something that the residents sometimes play up for tourists. Sardinia is much the same (minus the Mafia association), but is prominent for its visible and audible bilingualism, with Italian and Sardinian (Sardu) having equal status much like English and French in Canada. Both regions also figure in Italian history for having been the home territories of two leaders of Italian unification: Victor Emmanuel II (King of Sardinia) and Giuseppe Garibaldi (Dictator of Sicily). And with that, you get the picture of how a journey throughout Italy alone would feel like visiting several different countries at once (never mind the two actual countries they have in their territory: San Marino and The Vatican). The nation and the people are also hardy in common, whose political crises never quite stopped their economy becoming one of the world’s leaders. This enables them to promote their near-bottomless wealth of human history, varied culture and fine arts, which never fails to attract tourists from all over. The Boot of Europe is an experience that is everything advertised and so much more. If Rome is the biggest city in Italy, then running in second place would have to be Milan. It has a place of prominence among the major communities of the peninsula for both its deep historical roots and its present-day status as an economic powerhouse. Situated up north in the storied region of Lombardy, Milan at one point was a capital of the Roman Empire. Now not only does the city serve as a museum of sorts for the exciting and terrible events that have transpired upon it during its history, it also proudly acclaims itself as the second wealthiest city in the European Union, behind only Paris in France. Thanks to the cultural uplift given the city since the Renaissance, Milan has not ceased in pushing the envelope when it comes to business and finance, as well as arts and culture. As a “Global City” its local economy is intricately tied to that of the whole world; therefore it is not for nothing that Milan is home to the Italian Stock Exchange and some of the biggest names in clothing fashion and design. It is a city well-immersed in the 21st Century, but whose roots go as deep as the times of the Roman Empire itself. Few cities could ever come so close to perfection as Milan. Settled as early as 400 BC by Celtic Tribes, what would become Milan was conquered by the Romans two centuries later. And when the Emperor Diocletian made the first division of the Empire into East (which he ruled) and West, Milan became the Western Capital rather than Rome. Unfortunately the decline of Roman civilization made the city a prime target of barbarian invaders like Attila and the Lombards, for whom the region would be name after. 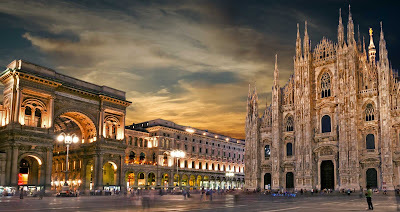 Milan’s territory would be contested by Italian, Austrian and even French rule, but the constant political upheavals over the centuries did not stop the Renaissance from turning the city into a center of culture, until it joined a united Italian nation. Today the traces of Milan in Roman times can still be seen, either preserved as in the Colonne di San Lorenzo, a colonnade of Corinthian columns from the 2nd Century, or remembered as in the Porta Sempione which stands at the former site of its ancient walls. Milan is not lacking in religious representation as well. The city has quite the number of basilicas, honoring many figures of the Catholic faith. There is the Basilica di Sant’Ambrogio dedicated to the city’s patron (Saint Ambrose), the Roman-era Basilica of San Lorenzo, and the Basilica di Santa Maria delle Grazie, a UNESCO World Heritage Site by virtue of being the home to a masterpiece mural by the original Renaissance Man, Leonardo da Vinci himself. It is, of course, none other than “The Last Supper,” painted in the refectory of the basilica’s convent. Just as magnificent as these three is the Gothic-style cathedral for the Archdiocese of Milan, called the Duomo. It is the third largest church in the world and the largest within Italy (as Saint Peter’s Basilica is inside the Vatican). But Milan has more to offer than just Ancient Rome and the Church. It does indeed boast an impressive collection of fine art to be found anywhere. One of Italy’s twenty Accademi di Belle Arti (premium art schools) makes its home in the city, the Brera Academy. Upstairs from the school proper is the Pinacoteca or “picture gallery” where many works of masters, gathered together by Napoleon when Milan was part of his empire, await art fans. Italian legends such as Titian, Tintoretto, Veronese and the Bellini brothers are exhibited alongside peers from elsewhere like Goya (Spanish), Rubens and Van Dyck (Dutch). Even the old dead of Milan are enshrined in magnificent edifices. It can be seen when going to the Cimitero Monumentale where many famous Milanese like Alessandro Manzoni are interred, and a sober monument to the victims of the city’s concentration camp during World War II stands. Coming closer to the turn of the 20th Century, tourists can window shop to their hearts’ content at the Galleria Vittorio Emmanuel II, the world’s oldest “modern-style” shopping mall (opened 1877) named after the first King of a unified Italy. Today it plays host to haute couture brands, luxury retailers and the world’s only seven-star luxury hotel (since 2015), the Town House Galleria. Are you seeing a pattern here? There can be no doubt to the world-class level of Milan with these attractions around. The city also has its own major contribution to science and technology, courtesy of the Museo Nazionale della Scienza e della Tecnologia, a name that needs no translation. It is also dedicated to Leonardo da Vinci, who was as much a scientist as he was an artist. The museum has themed sections showcasing various subjects like the manufacture of modern products, history of transportation, generation of energy, history of communications, and a section containing the many mechanical designs and inventions of da Vinci himself. This place connects the Milan of the past with the present and future, as fitting for a city with plans to build a tech hub for Google, Microsoft, Apple and more. And I did not forget about Milan being a Fashion Capital of the World either. The words “Milan Fashion Week” should be enough to spell out how clothing fashion and design play a major role in defining the city. Tourists going to Milan in February or March may be just in time for the Autumn/Winter version of the semi-annual event, with the latest spring/summer collections being brought out at either September or October. It even has a trade fair counterpart in the Milan Furniture Fair held every April. Milan is a city where history runs deep, where faith is strong, where great ideas were thought out and developed, where fine art is appreciated, where the fashion sense is at the vanguard of the world, and where technological progress is very much welcome. It is a Renaissance city with all its various strengths, and therefore rightfully takes the spot of one of the foremost metropolises in both Italy and the world. The Italian Republic has the unusual honor of having two nations as enclaves, meaning these countries have their entire respective territories completely landlocked by Italy. It stands to reason then, that these enclave nations are among the smallest independent countries in the whole world. One is the Republic of San Marino, centered on Monte Titano in the middle of the Italian peninsula, but close to the Adriatic shore. The other enclave holds the distinction of being the smallest independent country in the world, in that it can be considered an enclave twice over, by virtue of being just as landlocked by the city of Rome, capital of Italy. And yet this state, Vatican City, packs a mighty clout for its small area, it is after all the seat of the Holy See, the central government for the Catholic Church. And standing as its head of state is the Bishop of Rome and Supreme Pontiff of the Holy Church, the Pope. As a result the Vatican is an example of a theocracy, a state where the government is the church itself. This makes the small enclave a vast treasure trove of artworks and writings pertaining to the Christian faith, all contained in a sprawling network of ecclesiastical buildings, basilicas, chapels, palatial residences, museums and the like. And owing to its small land area and being enclosed by protective walls that have stood for centuries, the Vatican is the only nation on Earth with the charming ability to literally lock up its own gates for the night, opening them again in the morning for the daily rush of international tourists and pilgrims. What would become Vatican City was built on the similarly-named Vatican Hill, due west of the original ancient city of Rome and its seven hills, and just a ways north from the nearby Tiber River. In the time of the Roman Empire it was a favored site for building villas by succeeding emperors, outside the increasing congestion of Rome itself. During the reign of Nero, many Christians were martyred on the site after they were blamed for the great fire in the city that took place in 64 AD. Among those put to death was Saint Peter, leading apostle of Jesus Christ and traditionally held as the first Pope of the Church. From then there grew a necropolis, or cemetery complex, where the Christians tended to worship in secret until they were accorded protection by later Christian emperors. In honor of Saint Peter, who was buried on Vatican Hill, a basilica was erected on the site, the beginnings of the great complex of structures upon which the Christian Faith would spread. Following the downfall of the Roman Empire, the Church would go from the Vatican and take control of Rome and a swathe of land called the Papal States, evolving from a purely religious authority to a temporal power as well. This arrangement would last until the unification of the Kingdom of Italy, and in 1929 the Vatican would come into its present form, a microstate within the Italian nation from where the Pope would govern the global Catholic faith. The main point of access into Vatican City today is the Ponte Sant’Angelo spanning the Tiber, from which connects the Via della Conciliazione roadway which leads into Saint Peter’s Square, the massive plaza in front of the world’s largest church, Saint Peter’s Basilica. On almost every important occasion of the Church one can count on the square to be filled with people, and the Pope would conduct masses outside in these times. The Basilica is actually the second building to carry the name as the old Basilica built under orders of Emperor Constantine in 318 AD fell into ruin. It is notable having been designed by some of the greatest artists of the Renaissance from Michelangelo to Bernini. Visitors are sure to gape at the statues of the saints and the massive dome outside, or the bronze furnishings inside. The twisting bronze columns of the baldacchino stand just over the underground stairway that leads to the tomb of Saint Peter and several other Popes. To one side north of the Basilica is the Apostolic Palace, residence of the Pope, as well as the Sistine Chapel where the College of Cardinals gather in conclave for Papal elections. The ceiling of the chapel is filled with paintings of religious scenes by Michelangelo, including the famous “Creation of Adam” (touching fingers) and “The Last Judgment.” It is a somber place to emphasize the grave business that is conducted here in between the reigns of Popes. Having existed in the same place for centuries, the Vatican has been able to preserve much of human history within its walls. Many of their collected relics and artifacts are on display at the Vatican Museum, along with olden-time maps and artworks from Renaissance master Raphael, plus a library with priceless manuscripts. As a state in and of itself, the Vatican contains within its territory everything the Pope and other religious functionaries would need. It has its own supermarket, pharmacy and printing press. It has a railway station and helicopter landing pad located within its many formal gardens. The Vatican operates its own newspaper, “L’Osservatore Romano” (“The Roman Observer”), radio station and television center. It also has barracks and outposts for the Papal security force, the Swiss Guards. The Vatican Bank mints its own Vatican-faced collectible Euros while its post office issues similar collectible postage stamps. Both are valuable to hobbyists and collectors from all over the world. It is hard to believe, but within its tiny land area of .44 square kilometers, Vatican City contains so much wonder, history and religious value that visitors rarely ever get to experience everything it has to offer. And for good reason; as seat of the Holy See, the Vatican is the actively beating heart for the Catholic Church and tourism, while welcomed, is regulated so that the duties of the Pope and the rest of the faith’s leadership may not be disrupted. Still, it is able to open up to the world, so that people from all over might see for themselves the treasures of history and religion, and appreciate both all the more. As Jesus Christ said in the Bible, he would build his Church on the Rock, and upon the hill where Saint Peter – his Apostle whose name means “rock” – was buried, those words were fulfilled. The twelfth season of “American’s Got Talent” on NBC came to a close last week, following another intense period of fierce competition from performers of every conceivable stripe. Interestingly, when Finals Night came around last Wednesday, the last two remaining contestants left before a grand winner would be declared by host Tyra Banks, were two young girls. One was a singer and ventriloquist from Oklahoma City, and the other was a 10-year-old medical survivor from Atlanta. In the end, 12-year-old Darci Lynne Farmer emerged victorious against all comers, but it was still all good for Filipina-American Angelica Hale, for she finished in second place as runner-up. As CNN Philippines tells it, little Angelica became a darling of the audience and judges when she took the stage on Finals Night of “America’s Got Talent” season 12 last September 20. Her final performance piece was a stirring rendition of “Symphony” by Clean Bandit featuring Zara Larsson, in which she finished off with some impressive vocalizations towards the end. Ultimately it was not enough for Hale to beat the just-as-phenomenal Darci Lynne, but the young diva was already grateful enough that she had the chance to compete all the way. “Couldn’t be any happier!” wrote Angelica on her Twitter page. 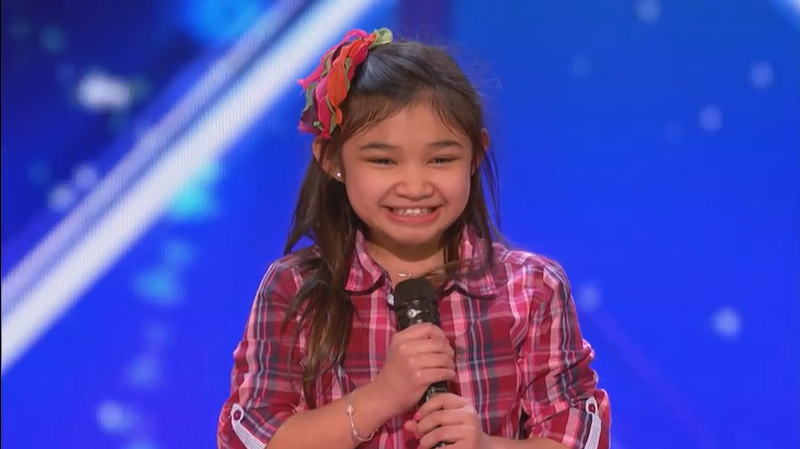 “What an incredible journey, thanks to ‘AGT’ & America for having me along until the very end!” Of course that is not quite the end of the “Talent” journey for her, as she will be joining Darci and the other Top Ten acts of season 12 during the live post-show performances on November 3 and 4 in Las Vegas. Born in 2007 to half-Filipino, half-Caucasian James Hale and full-Filipina Eva Bolando, Angelica showed an aptitude for singing as early as age 2. But according to ABS-CBN News, her life was imperiled when she was 4 by a bout of severe pneumonia followed by septic shock-induced multiple organ failure. A kidney transplant from her mother helped Angelica pull through. Following some formal voice lessons, she began competing and performing for both charitable functions and events like the 2015 US Open and Miss America 2017. At roughly about the middle portion of the Italian peninsula in the Mediterranean Sea sits one of the greatest cities in the world. It is not without full reason that it goes by the moniker of the Eternal City, having existed as a city for over two millennia and a half. Straddling the River Tiber and nestled upon seven hills lies Rome, once a city-state that became the center of one of the oldest republics, then the heart of the most glorious empire in ancient times, then the center of faith for one of the major religions of the world, and now capital of the Republic and former Kingdom of Italy. Rome has served the greater history of man in many different ways through the passing of centuries. Today it is a major tourist destination on the sheer weight of historical value alone, and it is only enhanced further by its rich culture and arts scene, plus its proximity to the beating heart of the Catholic Faith. 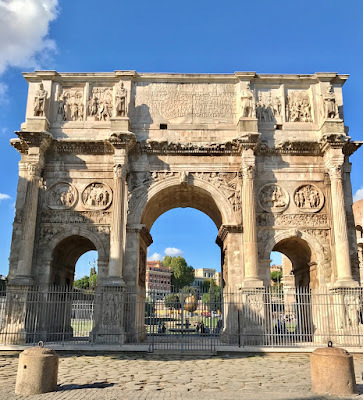 While the modern city of Rome, and the greater Metropolitan Rome, has territory that now far dwarf the land area occupied by the historical, ancient city, it is the spot to the east and north of the meandering Tiber River where the best of the sights can be seen. The vaunted Seven Hills of Rome are arranged in a rough circle with the Palatine Hill in the center. The Palatine is said to be one of the most ancient parts of the city, and is filled with a number of residences by the emperors of the Imperial era; it is from the hill’s name that the word “palace” comes from after all, and the likes of Augustus, Tiberius and Domitian had magnificent domiciles sharing space on the hill with temples for Apollo and Cybele. At points around the foot of the Palatine, one can find some of the most iconic structures of Rome: the Forum or marketplace, the Coliseum amphitheater – synonymous with the city itself – where gladiator contests and the like were held, and the ancient chariot race stadium called the Circus Maximus, now a public park. To the north west of the Palatine is the Capitoline Hill, where once were located other temples to the ancient Roman gods, and then as a site for the civic government for Rome. It is this function that led to the name Capitoline becoming the origin for “capitol” or a legislature government building. These government houses, designed by the great Renaissance artist Michelangelo, are now a museum complex showcasing marvelous works of art from all across the great periods of Roman history. The other hills of Rome have their own treasures to be found as well. The Quirinal Hill, north of the Capitoline, is the site of the palace that is now the official residence of the Italian President. The American White House is only one-twentieth its size in comparison. The Aventine is a quaint residential area with its own basilica (of Santa Sabina) and the city’s Rose Garden; well-off Romans make their homes at the Caelian and the Esquiline (where the Basilica di Santa Maria Maggiore is). Finally the Viminal is home to government offices, the Teatro dell’Opera and the grand Rome Termini, or railway station. But there are other magnificent sights to be seen outside the core of earliest Rome. Close to the Quirinal is the Trevi district that is the site of the famous Trevi fountain, and allegedly a traveler’s magical assurance that he might return to Rome in the future (by tossing a coin into it, naturally). Not far from there is the Piazza di Spagna, the former Spanish Embassy to the Holy See, that is reached by the picturesque Spanish Steps. A bit further west, closer to the eastern banks of the Tiber, is the Pantheon, a former Roman temple that is now a church. Crossing the Tiber to the western bank, one can get to the Parco Adriano where the Castel Sant’Angelo, an old Papal fortress, stands. 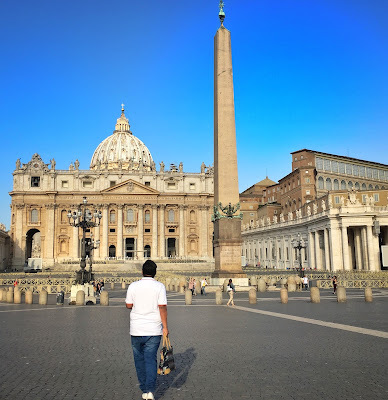 From there it is but a ways to the north and west where can be seen Rome’s most esteemed guest, the world’s smallest country within its city limits and seat of the Pope of the Roman Catholic Church: Vatican City. Standing on the same-named hill due north and west of Rome of the Seven Hills, it would draw countless numbers of faithful to visit and celebrate mass and other milestones of the Christian calendar with the Holy Father, all of whom would make the short trip from the grand city all around it. It was said that the first Caesar of the Roman Empire, Augustus, remarked that he first saw Rome as a city made of brick, and that he left it as a city made of marble. 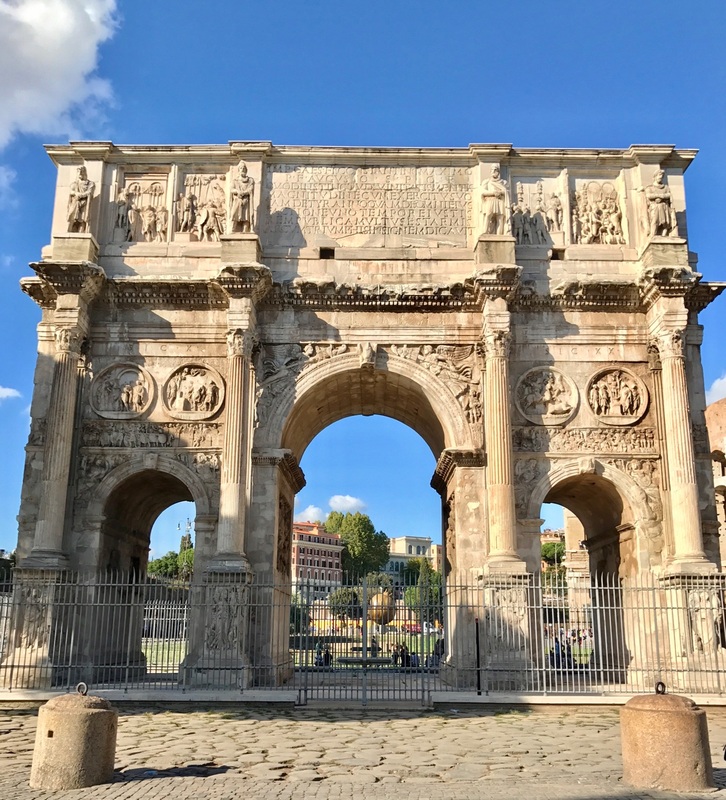 That anecdote poetically illustrates the grand evolution of Rome, from the heart of a great ancient civilization, to the center of a worldwide faith, to a beacon of fine arts and culture during the Renaissance. The modern city that stands today carries the memories of its past forms proudly, presenting them for the world to see and invite them to visit, again and again. This is the glory of the Eternal City that is Rome, one that will continue to fascinate all people of this age and beyond. Julia stars as Mika, a college student with a quirky hobby and a heavy weight on her soul. She had been especially close to her mother (brief role by Carmina Villaroel), a woman who while wasting away from an illness has expressed great interest in aliens and a belief that she will be abducted by them eventually. After her death, Mika has become increasingly estranged from people, especially her dad (Ariel Rivera) who has remarried and whose second wife/Mika’s stepmom (Maricar Reyes) is now expecting a baby. Unable to move on from the loss of her ma, and believing that her memory will disappear from their family, Mika runs away on her car, with her destination being a spot where UFOs have been reported in the Philippines. The fact that said site is a mountain with steep rocky peak gives a morbid undercurrent to her driving desire to be “taken by aliens” like her mother once promised. En route to Mt. Milagros, Mika runs into an initially unwanted travelling companion in Caloy (Joshua Garcia). Caloy was cycling by his lonesome to a town where his father, who left his mother (Cherrie Pie Picache) when he was a child, is said to be currently residing. He hitches a ride with Mika after her car runs over his foot, which gets a welt that takes quite long to heal. As she learns, Caloy has leukemia, explaining the many bruises on his body. Still, his rather chipper demeanor seems to clash with Mika’s brooding thoughts and single-minded purpose. As expected, romantic comedy ensues. The main body of the film is a quaint and picturesque road trip across the Calabarzon Region while Caloy and Mika try to figure each other out. The fact that during their journey they end up “adopting” a chicken that escaped being turned into a “tinola” is a cheeky indicator of what their interaction is going to end up becoming. And the things they learn about one another also plumb some hidden depths within their respective selves. 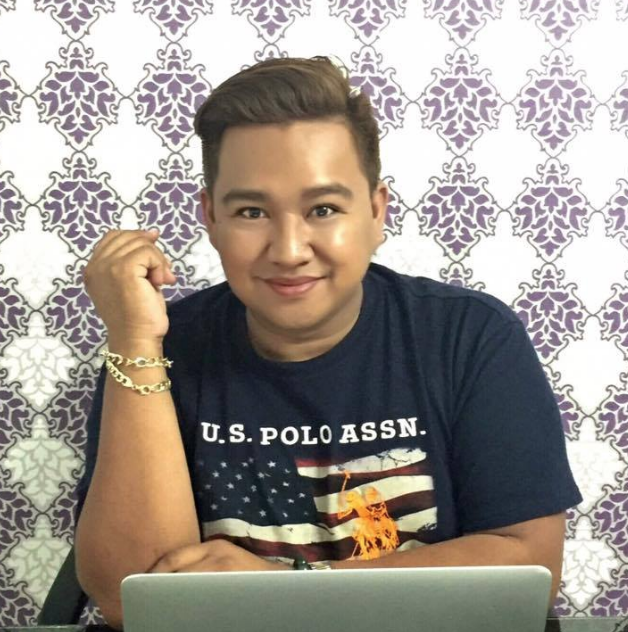 Caloy, while outwardly positive despite his cancer, also has a fragile facet whenever his absent father and his mother’s financial woes for his treatment get brought up. Mika on the other hand discovers that while she has a stronger bond with her departed mother, it may not be worth letting go of the family she still has. I will spoil that at some point in the movie, both of them appear to be on the summit of Mount Milagros, calling down the aliens with a wacky chant, but what happens next must be seen by you. The daughter of veteran film stars Dennis Padilla and Marjorie Barretto, Julia Barretto has built up a veritable acting résumé (and award accolades) with ABS-CBN’s TV and movie studios for over a decade now. 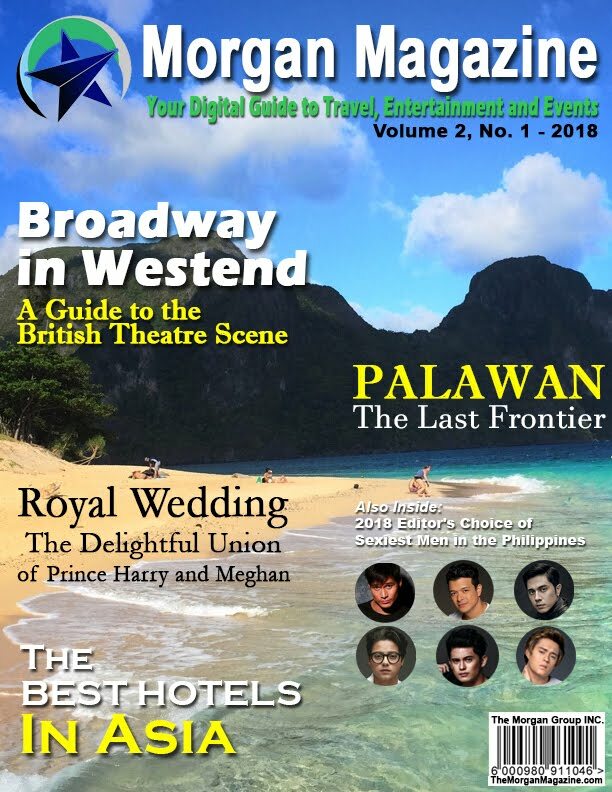 She has also been paired with a menagerie of leading men, but it’s only recently that she seems to have achieved remarkable onscreen chemistry with 2014 PBB Housemate Joshua Garcia, who has also begun making inroads with cinematic roles after some time on TV. Josh has been noted as channeling the charisma and character acting style of John Lloyd Cruz when he was that age, and his dynamics with Julia has already been proved in 2016’s “Vince and Kath and James” (albeit as part of a love triangle with Ronnie Alonte). 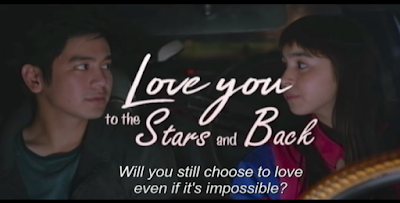 “Love You to the Stars and Back” finally gets to show them build up as a couple with no alternative pairings. The rest of the cast, despite reduced roles due to the story focus on Joshlia as Caloy and Mika, still definitely portray their roles well with true veteran skill. Carmina’s flashback role as the alien-obsessed mother of Mika is bittersweet, so is the portrayal of Ariel as the well-meaning but moved-on dad and Maricar as the not-wicked stepmother. Cherrie Pie is also a bright spot as the motherly concerned single mother to Caloy doesn’t disappoint either. The film itself boasts an appropriate soundtrack built around the Moonstar88 song “Torete” (covered by Moira Dela Torre) as the theme. It’s indeed a balance to both entertain and teach something, especially for a matinee feature film intended mostly for general audiences. Star Cinema proves its dominant position as the premiere Philippine movie studio, helped along by the Joshlia pairing, with “Love You to the Stars and Back,” a quaint movie that covers the middle of the year (apart from the holiday film-fest crowd) quite nicely. After five years of being a local manufacturer of smartphones in China since starting in 2009, Vivo went international by entering the market in Thailand, and they have not looked back since. From Southeast Asia to India and Pakistan, Vivo smartphones proved themselves a formidable product that could go toe to toe with major global brands. Their latest gadget the Plus 5 has been getting a lot of marketing power in the Philippines most especially, thanks to a celebrity endorsement from NBA superstar Stephen Curry. But Vivo is more than just having big-name brand ambassadors. 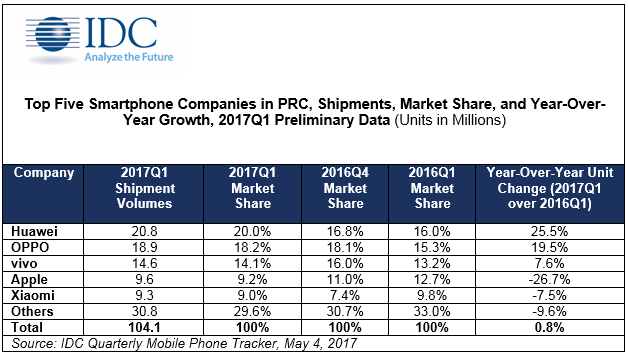 In the latest Quarterly Mobile Phone Tracker of the International Data Corporation (IDC), Vivo has secured a spot among the top 5 global smartphone brands for Q2 of 2017. The quarter-to-quarter growth of the company’s sales has been calculated at an impressive 66% rise from Q1. IDC Asia-Pacific market analyst Jerome Dominguez remarks that Vivo’s speedy expansion was contributed to by a combination of incentives for aggressive sales promoters, extensive retailer support and marketing spurred by cash-rich ventures like the Steph Curry sponsorship. 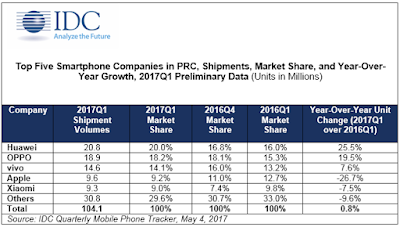 These factors led to a vigorous shakeup of the vendor-dealer relationship in different markets across the globe, something that major vendors may have been able to adapt, but has spelled the loss in market shares for smaller ones that Vivo managed to take advantage of. 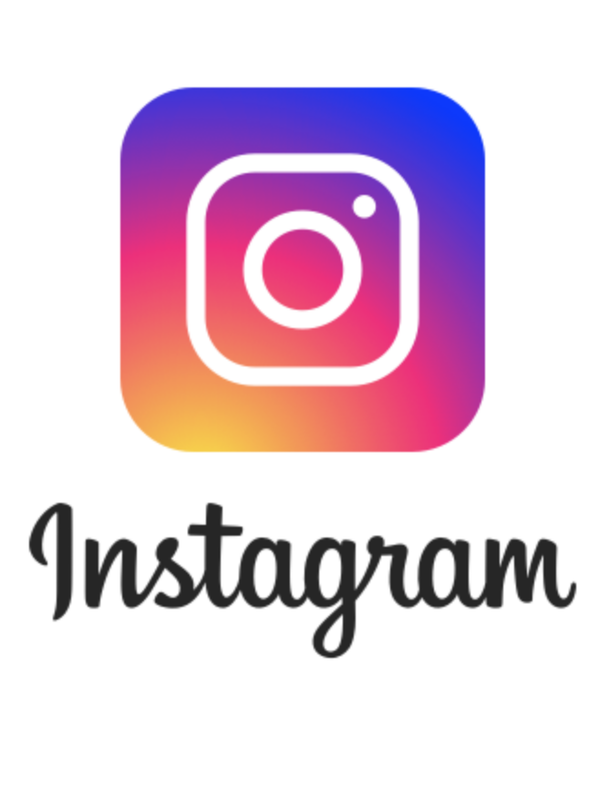 Major marketing campaigns have been carried out in the Philippines to push the Vivo V5. In addition to the high visibility of Stephen Curry in advertising for TV, print and billboards, local celebrities like Tony Labrusca and McCoy De Leon have been out in force performing during weekly mall tours in Metro Manila and points beyond. It is no surprise therefore that Vivo has become a smartphone brand that is constantly in the forefront of choices for Filipino gadget buyers and owners. The Vivo V5 is a smartphone running on Android 6.0, with 4GB of RAM and a non-removable 3000mAh battery for long charge life. It is the first mobile phone to have a 20-megapixel front camera with amazing bokeh effects, making selfies look like they have been taken by a professional single-reflex cam, with different selfie settings. The 13-megapixel rear camera is no slouch either in capturing crisp and vivid images. The V5 is available in three colors: crown gold, rose gold and matte black. IDC is the global leader in providing market intelligence on the info-tech market. 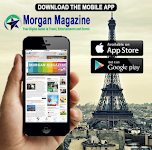 They expect smartphone sales to balloon in the latter quarters of the year as the Christmas Holidays come near.